Outfitters Supply™ Horse Packing Equipment…We Use Our Gear. Whether you are a professional outfitter or a weekend camper, reliable horse packing and mule packing equipment is an absolute must. Nothing could be more frustrating or potentially dangerous than having a failure in your horse packing equipment when you are 30 miles from the trailhead. Our staff has field tested all of our horse packing equipment before make it available to our customers. Reliable mule packing and horse packing equipment begins with a quality pack saddle. Our Sawbuck Pack Saddles and Decker Pack Saddles are built to last a lifetime of hard packing and are the pride of the Outfitters Supply™ shop. The TrailMax™ Not-A-Knot is a great pack system for a beginning packer or anyone intimidated by knots. Anybody can pack with the Not-A-Knot. There are no manties, no ropes, no fancy knots. The Ralide-West™ pannier boxes hang easily on a sawbuck or Decker pack saddle. The panniers then buckle to the cinch for stability. The top pack buckles to the boxes. Once on, it is like having a diamond hitch securing your load. The Not-A-Knot horse packing equipment puts the fun into packing right away. However, if you have odd sized loads to pack, need to pack in hay bales or just simply wish to have your own system of more traditional horse packing equipment, manties are a necessity. Our manties are a standard 7’ x 8’ and made of strong 18 ounce canvas. Our vinyl-lined canvas Oversized Panniers are great for bulky items, duffel loads or a cooler. TrailMax Bear Proof Pack Panniers are very convenient for packing food, kitchen equipment, etc. Canvas Panniers or Canvas and Leather Panniers provide packers with a soft pannier that can also accommodate the PolyPac Inserts for structure and protection. They also offer packers a more traditional look for their horse packing equipment. Top packs are a wonderful addition to your horse packing equipment. They provide you with additional space for packing lightweight bulky items such as clothes, sleeping bags and roll-up camp furniture. Additionally, most packers will cover their loads for protection against adverse weather. Our Packers Rain Cover is durable vinyl coated and designed with ties for secure attachment to your panniers. For a more traditional look, many packers will use manties as a raincover. 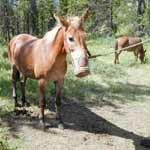 Your mule packing and horse packing equipment should include items to care for and control your stock in camp. Feedbags help you safely feed grain or hay cubes to your stock in camp. Hobbles, highline and picket kits and portable electric corrals keep your stock safely contained in the backcountry. Our Mule Halter and the Packer's Halter offer lead rope attachment rings for "side pull", "center pull", or "no pull", allowing you to regulate cinching and tightening on the noseband. You can rest assured that any piece of horse packing equipment that you purchase through Outfitters Supply™ has been designed with you and your horse in mind to ensure both of you have a great experience packing in. 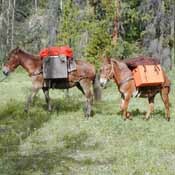 Outfitters Supply™ horse packing and mule packing equipment…we use our gear. Russ On… Should I Pack Horses or Mules?